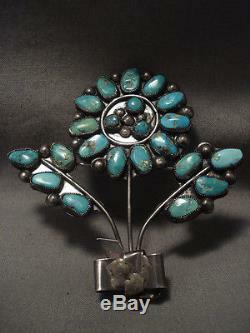 This is an astonishing vintage Navajo museum quality very old flower silver pendant/ pin. Located on this pin/ pendant are huge old Blue Gem turquoise stones. The piece consists of heavy old natural patina and measures around 3" X 2-7/8". The stones measure around 3/8" x 1/4". The item "XXL VINTAGE NAVAJO TURQUOISE FLOWER SILVER PIN OLD EARLIER 1900'S" is in sale since Monday, January 04, 2016. This item is in the category "Collectibles\Cultures & Ethnicities\Native American\ US\1800-1934\Jewelry". The seller is "nativo-arts" and is located in New Mexico, USA.